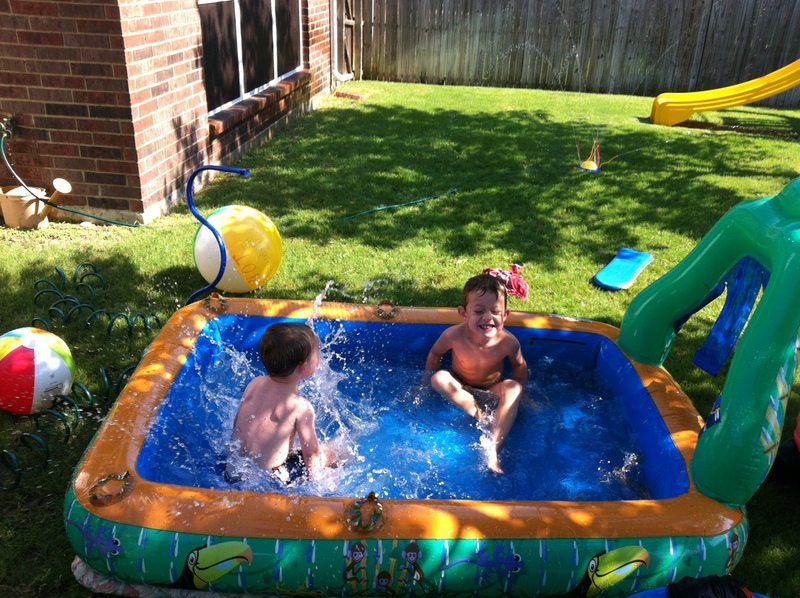 Last summer, my boys wanted to blow up our little kiddie pool in the backyard, but Big Daddy was gone and I didn’t know how to work the air compressor, so I decided that I would just have to go old school on that pool. Well, sorta old school. I used a bicycle foot pump. But I did it. I struggled through. Switched out which foot I used several times. Sweated. Huffed and puffed. Used my hands to work the foot pump a few times cause my legs were giving out. But I kept going and finished it. Even had to blow up the little extra decorative parts using air from my lungs. And then, I realized… one of the little extra blowup parts that made the pool look like a rainforest… had a hole. It wasn’t the WHOLE pool that had a hole, but still, If I didn’t keep that part aired up it would fall over into the pool. I mean, the pool would still be usable, but not as fun. My faith has been so much like that pool the last few months. It has needed constant work to keep it aired up. And it just hasn’t been as much… “fun”. But, it’s worked. When my sweet grandmother went to Jesus in November, my faith was there… it led me immediately to Jesus. He was my comfort, my hope, my refuge. Then my faith went back to “keeping it aired up” status. Not splashing around. Not resting in the cool comfort. Just working at keeping it going. But lately, there is this tiny… okay, maybe not tiny, but very small… almost imperceptible change happening in my heart. Where I find myself softly choosing Jesus instead of my own desires. Where I find myself longing for His Word. Where I find myself speaking words of adoration and thanks to Him. Where I find myself slowly, slowly finding calmness, contentment, perspective. Honestly… I can’t say that there is anything that I did, or didn’t do, that led to this change. Maybe I’m reading my bible again more. Maybe I’m praying more and with a little more faith. Maybe my Sunday School teacher is the bizomb and is ripping apart everything that I have believed and making sure I believe it for real. Maybe just picking up the Beth Moore book every couple of days is transforming me. Maybe it’s my life calming down a bit. Maybe it’s the Easter season upon me. Or maybe it’s just God’s plan. God’s timing. God’s change. Cause I learned a lot about myself, my faith, my God, my gluttony, my hurts, my hopes during that time of keeping my faith “aired up”. And I was reminded of how important it is to stay the course, stay steady. It doesn’t have to be a Beth Moore study every night, or a Jim Cymbala prayer, or a Billy Graham conversion. A verse a day. A prayer a day. A worship a day. In the car. On the potty. In my bed. At the dinner table. Quick and hurried. Tearful and begging. Flustered and worried. The key… is going back to Him. Keeping that faith aired up. Cause He’ll patch that hole. You keep it aired up and He’ll patch that hole when the time is right. When you’ve learned a little something. When you’ve realized how much easier it is to just let Him patch that hole instead of keeping it aired up. And then, for a bit, you can sit back, grab a glass of iced tea (peach flavored, if you’re really living it up), and relax in the cool, refreshing water of His Spirit. Thanks girl! Ya know… I think I love this one too! I just re-read it cause I needed a reminder already! Ha! Love your analogy…someone told me the other day (I’m sure you’ve already heard this one): If you want to make God laugh, just tell him YOUR plans.